Asthma is one of the most common reasons why kids miss school but missed class time isn’t the worst thing about childhood asthma. Asthma attacks can be frightening, severe, and dangerous enough to require hospitalization. Symptoms often subside or disappear completely as a child matures but permanent lung damage can occur, too. A recent study indicates asthma can be prevented if a baby’s gut bacteria (microbiome, microbiota) includes four specific types of bacteria during baby’s first three months of life. It is becoming increasingly obvious that one’s gastrointestinal microbiome plays an important role in full-body immune-system function. People who have a diverse array of bacteria and other microorganisms living in harmony in the gut enjoy greater immune protection than those with limited types of microbiota. As for childhood asthma, microbiologist Brett Finlay of the University of British Columbia in Canada, has determined that all it takes is colonization of just four types of microbes in the guts of babies within their first 100 days of life to enjoy a lifetime of protection against asthma. He and his research team tested his theory on hundreds of human babies and then tested it another way on mice. The Finlay research team analyzed the contents of 319 3-month-old babies’ dirty diapers to find which microbes were flourishing in each baby’s gut. By their first birthdays, 22 of these children were exhibiting symptoms of wheezing associated with asthma. By the time these 22 kids turned 3, most of them had been diagnosed with asthma. The researchers found that the dirty diapers of the 3-month-old babies told tales of what was to come, as far as asthma is concerned. The diapers of 22 babies who were wheezing at age 1 and those diagnosed with asthma at age 3 had few if any, evidence of four specific bacteria: Faecalibacterium, Lachnospira, Rothia, and Veillonella. Knowing the human babies with short supply of these four bacteria developed asthma, the researchers turned the table on laboratory mice specially bred to have inflammatory symptoms similar to those asthmatic humans have. They gave the mice these four bacteria to see what happens. Asthma is an inflammatory disease affecting the bronchioles, airways that transport air from the nose and mouth to the lungs. When the mice were treated with the four bacteria, evidence of bronchiolar inflammation was reduced. Their symptoms of asthma diminished or disappeared. Breastfed babies are less likely to develop asthma than bottle-fed babies. C-section deliveries raise a baby’s risk of asthma by 20% over those born vaginally. Antibiotics in the first year of life increase the risk of asthma later. Bottle-feeding and C-section deliveries limit the baby’s exposure to the beneficial microbiota in the mother’s body. Antibiotics kill off good bacteria as well as the bad. Martin Blaser, a research scientist specializing in the human microbiome at New York University, wrote a commentary to the Finlay study published in the journal, Science Translational Medicine. He wrote: “The microbes that babies have early in life are not accidental. They got a lot of them from their mothers. It's been going on since time immemorial." Blaser described the gut microbiota as helping “choreograph early human development” but “if you mess with that, then the choreography is different. There could be disease consequences like asthma." Kaneshiro, Neil K. "Asthma -- children." MedlinePlus. US Department of Health and Human Services, 14 May 2014. US National Library of Medicine. Web. 8 Oct. 2015. "Missing Microbes Provide Clues About Asthma Risk." Writer. Rob Stein. Morning Edition. NPR. 30 Sept. 2015. Web. 8 Oct. 2015. Finlay, B. Brett, et al. 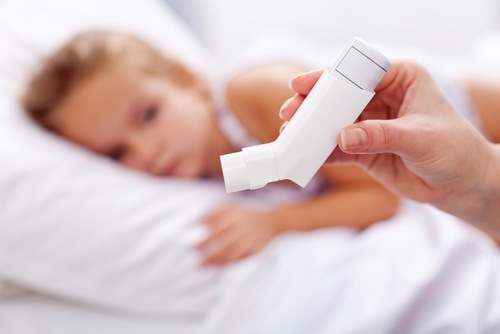 "Early infancy microbial and metabolic alterations affect risk of childhood asthma." Science Transitional Medicine 7.307 (2015): 307. Web. 8 Oct. 2015.